It’s obvious Tigger is a hostage forced to participate. Dora is just a psychopath, she’s enjoying this way too much. I dunno about that Fox critter. 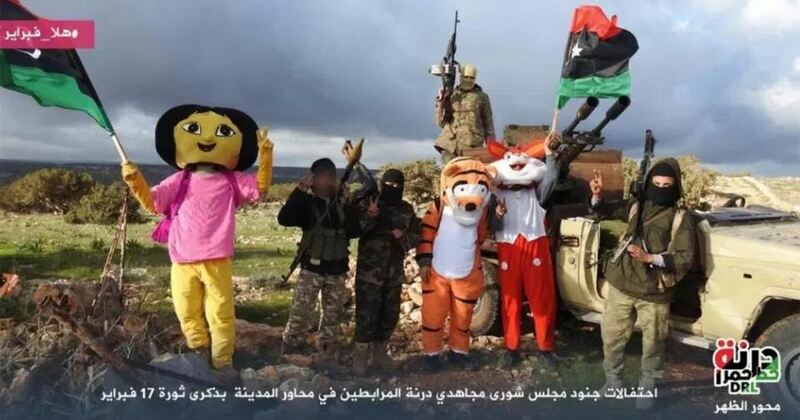 jihadists dressed up in costumes of cartoon characters Dora the Explorer and Tigger from Winnie the Pooh for this bizarre celebration photo. The picture was posted on social media to mark the the anniversary of the uprising against Colonel Muammar Gaddafi in February 2011.